Veteran journalist Diana Johnstone has given the American people and the world a weak-up call about Hillary Clinton. The author, who has been living in Paris for over 40 years, has characterized Ms. Clinton aptly. She is not interested in the existential problems of the man in the street, instead, she is the voice of the criminal big shot elite, starting with the Zionist Lobby, Wall Street, the military, the oligarchy, the intelligence and the corporate media. Their interests will be perfectly served by her and her even more dubious husband Bill. Both are going to run the US Empire as their private enterprise for the disadvantage of the American people but for their own perk. Johnstone seems almost certain that Clinton will lead the US into war with Iran and with Russia. Two years ago, she has already threatened Iran with total obliteration, and Russia’s President Vladimir Putin was called “Hitler” by this war-like agent of the financial oligarchy. She has promised her main donor, the Zionist mogul Haim Saban, that she will aggressively attack BDS, the boycott, divestment, and sanctions campaign against the brutal Israeli occupation, and she will elevate the American-Israeli relations to a “higher level” whatever that means. Is she going to fight the next war against Iran for Israel, although the Iranians do not threaten anybody such as the right-wing Zionist regime? Clinton makes the most of her foreign policy talents but these “talents” let the US into chaos. She supported the Afghan surge, the Iraq War, pushed President Obama into the war against Libya, organized weapon supplies for the terrorist in Syria and calls for a massive intervention in Syria. The author can’t hide her disappointment with the submissive role of the EU towards the US that treats this hodgepodge of states arrogantly with the sole exception of Germany. Especially the role of the French President seems very repulsive to her. Johnstone is very hard of the former member of the EU parliament, Daniel Cohn-Bendit from the Green Party, and the Greens in general. Members of the Green Party like Joschka Fisher, Cohn-Bendit, and other so-called pragmatists were war-horny to lead Germany together with the US into the war against Serbia. To portrait herself as a “feminist” is as phony as the whole Hilary Clinton campaign. Only Bernie Sanders can stop this cold warrior if he decides to play the new Ralph Nader in order to prevent a mortal danger to the United States of America and the world. But Hillary Clinton is not America’s biggest problem. Both parties, Democrats, and Republicans alike are under the heel of the War Party. There is not that much of a difference whether Clinton or Trump who act on Washington’s stage. A very informative and witty book that has just been published in German. It’s highly recommended because anyone can read what kind of questionable person Hillary Clinton is and the danger she represents to world peace. The author gives the readers a clue what’s globally is at stake. Hillary is just scary and more dangerous than all Republicans put together. 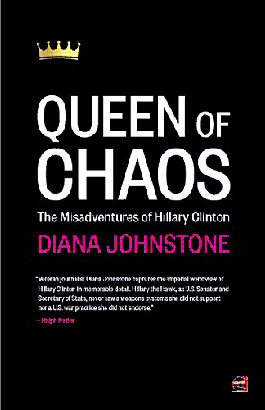 Queen of Chaos: The Misadventures of Hillary Clinton, Counterpunch 2015, $ 14. Only the really stupid think Clinton did anything illegal after reading the State Dept. report. The problem with too many conservatives is that they get their information from some people who have no respect for the truth. The also want to go back to the good old days, when they don’t really remember those days. They complain about Obama, but the deficit and unemployment are the lowest since Bush left office. Mistakes have been made, but Hilary Clinton accepted her responsibility for Benghazi, that is better then what Westmoreland ever did. 30,000 men died because Eisenhower reacted too slowly in the Belgium. MacArthur got thousands of men killed because he ignored the intelligence about China and kept advancing. Westmoreland became Chief of Staff and Eisenhower became president. They gave Mac Arthur a ticker tape parade. The whole mess with the Taliban began with Reagan arming them. 241 Marines died in a terrorist attack when Reagan was president. They did not spend 7 million dollars investigating him. But then the national debt went up 189% when Reagan was president. This was because he had to buy his way out of another Republican recession. Hilary Clinton got cross examined by a bunch of fools who got themselves elected to Congress. They spent 7 millions dollars doing it. 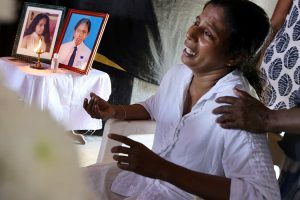 She acted with dignity and looked them straight in the eye. I though she was a class act. The Republicans hysterical obsession with Benghazi is stupid and even self destructive. That is one of the reasons they have ended up with Donald Trump. Clinton is accused of breaking the State Department rules when the State Department knew about it and did nothing. Millions of more dollars have been spent for this investigation and nothing has come of it. Charity Watch gives the Clinton Foundation a A rating. Charity Navigator did not grade the Foundation, because their program was not set up to judge the Foundation. The House of Representatives whines about government waste, then it does stupid things. This country would be a whole lot better if it got rid of the Tea Party crazies and got the government working again. By the way, when Bill Clinton left office, the budget was balanced, there was no deficit and the economy was great. This book adds to the exposition of Clinton and her deeds and boasting as a champion of women. It is informative with lighter vein .